Nationwide United Auto Transport ships hundreds of vehicles each day, with classic and vintage cars being some of our favorites to move. 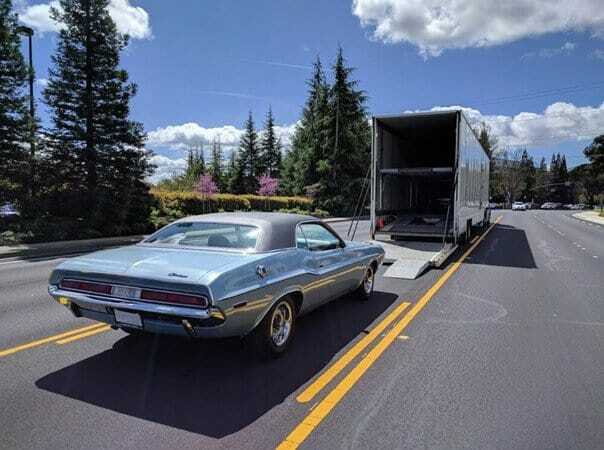 Please note that whether you decide on an open car shipping or enclosed transport, we strongly recommend the enclosed trailer for classic vehicles because we understand the importance of their value. With that in mind, we can provide a hassle-free experience no matter which service option you decide on. During a long-distance transport, debris, road, and weather conditions can dirty your vehicle and most high-end car owners want their vehicles looking their best at all times. If you have a classic Model A or a neck-turning BelAir, you will want to keep the elements far from your vehicle’s exterior, so opting for an enclosed transport would serve you best with that concern. We have specialists on hand that are ready to formulate the best transport for you and your one of a kind vehicle. Fully Covered & Enclosed Transport – We only operate hard-side covered carriers. Soft Strapping – We secure vehicles using soft straps. Non-Stacking Enclosed Transport – Our 2-3 car enclosed “hotshot” are non-stack. Door-to-Door Delivery Service – No need to drop-off or pickup at terminals. Expedited Shipping (if needed) – Faster pickup, delivery and transit times. Local and Nationwide Service – Across town or across the country, no remote city or town is out of reach. 24/7 Customer Service – We are always available to help answer any questions. We walk you through the entire process. Stress-free solutions no matter what your shipment needs are. Insurance coverage is included to your shipment as part of the FMCSA license and insurance regulations. Pickup and deliver your shipment as fast as possible. Same day-next day services when available. Our hours extend a 9 to 5 transport company. We are always available to answer your transportation questions. The hallmarks of vehicles are of the classical, vintage, or exotic variant. They have some of the most iconic looks in vehicle history and are heavily sought after. You will usually find the vehicle of your dreams (for a decent price) far from your location, which means you will have a “long-distance” buy. Once you own one of these beautiful vehicles, you will need a transport to get it to your front door- safe and sound. We have reliable coordinators and drivers that will make your transport smooth and give you peace of mind. We give you the information necessary to stay in touch with your driver at all times. We know how stressful it is to have a car transported by a stranger, and this stress is only increased as if you own a rare or high-end vehicle. With over 15 years of experience, we can set up a swift, safe, and reliable transport that will get your classic or antique vehicle to your front door looking at its top shape with our door-to-door service. Clean and wash your vehicle’s interior and exterior. The vehicle must be almost entirely empty for transport. Take pictures of existing dents or scratches. Pictures provide fair documentation in the event of a damage dispute. Some of these parts and components include antennas, DVD players, luggage racks, bike racks, toll passes, etc. An almost empty tank will help save weight and help avoid additional charges. Run the gas tank down to a quarter or eight full. Check breaks, including emergency breaks, battery, ignition, tires and fluids. Minor leaks can cause major problems, especially if vehicle is travelling hundreds of miles. Chris handled our transport perfectly! Shipping a vintage collector VW bus from Southern California all the way to Key West Florida was no small task. He did EXACTLY what he said he was going to do, and was on time every time. Thanks Chris! Great company, quick service and moved my Hemi Cuda from east to west, no problems at all, much appreciated. Very prompt. Very concerned. Nice enclosed two car trailer which is what you want. Not packed in with 6 others like the other transports use. Vehicle delivered to our residence amidst the rain & fog.Transporters were hard workers. Will use again. Great service! I would definitely recommend them to anyone needing to move a high end vehicle! Very professional, fast, and friendly service at very good rate!! Thanks Again!! Good group of people. Shipped an 800hp twin turbo car for us and took great care in doing so. The communication is really good and they will text if they can't reach you by phone, I appreciate that since I'm always walking away from my phone and rarely call back numbers I don't know. Thanks guys! Good price. The car was picked up on time. The car was delivered early. I was kept informed every step of the way. The driver's were a husband and wife team and very personable. They used a single car trailer and it was immaculate. I'm very pleased with the whole experience. Enclosed auto transport is the preferred shipping method to protect your vehicle during transport. Expedited transport allows you to get your shipment on the road to the new location in the fastest time possible. Shipping inoperable cars? We have the experience to ship non-running cars and make the entire process easy. Speak to a friendly transport specialists.